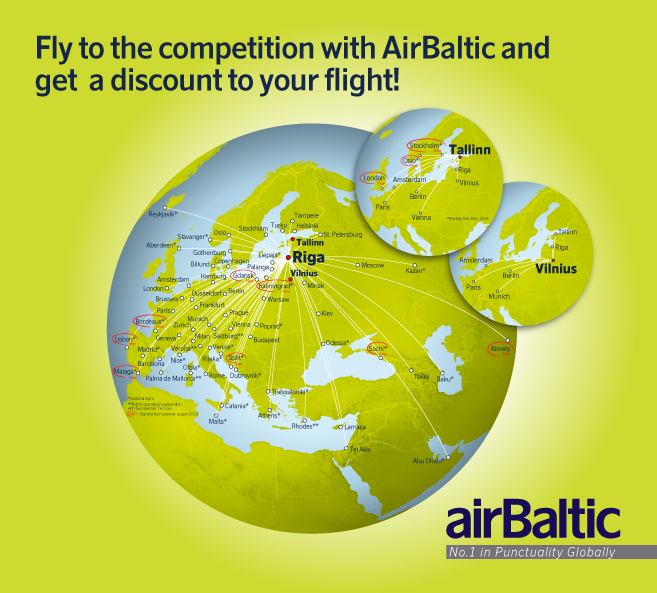 airBaltic (AIR BALTIC CORPORATION) is the world's most punctual airline connecting the Baltic region with 60 destinations in Europe, the Middle East, and the CIS. around 20% through his fully-owned Aircraft Leasing 1 SIA. The airBaltic fleet consists of 31 aircraft - 8 Bombardier CS300, 11 Boeing 737 and 12 Bombardier Q400Next Gen.
airBaltic has received numerous international awards for excellence, innovative services, and achievements in reshaping its business. In 2012, airBaltic was ranked by Airlinetrends among the Top 10 airlines globally for innovations. airBaltic achieved the best on-time performance globally in 2014, 2015 and 2017. 2. Click on the " % Enter E-Voucher(-s)" field and type in discount code GRANDPRIX18, continue by clicking on "Find Flights & Fares"
* Discount will not be applied to the campaign and special fares.